Mbitakola is a non-profit making association committed to promote and expose new talents. They have so far released a compilation titled ”De l’ombre a la lumiere” . 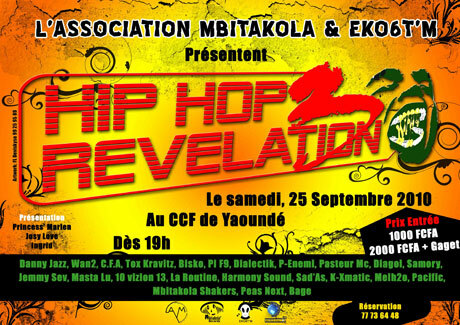 After two successful editions of their events, (30th September 2006 and 27th September 2008), Mbitakola brings to you the 3rd edition titled ” Hip hop Révélation 3” slated to take place on Saturday 25th September 2010 at the French Cultural Center in Yaounde from 7pm. GUEST : DANNY JAZZ, WAN 2, TOKX KRAVITZ, CFA. Réservation : 77 73 64 48.